Join us for our regular Third Thursday Demo on May 15 when Cyndi Foote will demonstrate a “cheater pineapple” block. This is a fun, easy block that uses up scraps and that you can make without taxing your brain too much. Really! 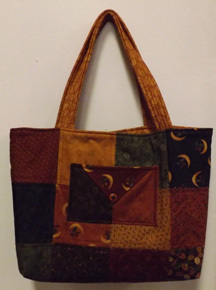 Bring a friend to Third Thursday Demo and stay to sew for the afternoon if you’d like. Karen is headed off to Spring Quilt Market this week and will no doubt return with many new patterns, notions, books, ideas and more. Join us for an After Market Review on Wednesday, June 4 at 5 p.m. We’ll have show and tell, refreshments, and you can weigh in on what new merchandise you’d like to see in the shop. See the end of this newsletter for details. Our occasional Sewing Sunday events have become quite popular. They’re relaxing and fun and everyone accomplishes so much in just a few hours without the distractions of home! Bring any project you’re working on (or a UFO that you really want to finish!) and meet other sewers/quilters. Come after church or after you finish your morning chores at home. Take an afternoon just for you! Sewing Sundays are always free but space is limited so reserve your spot soon. We provide light refreshments. Are you tempted to join in our pattern writing contest? Well, why not give in to that temptation today! Stop by the shop to pick up your entry form or e-mail info@cortezquiltcompany.com to request a copy. 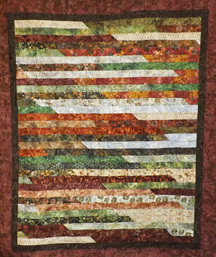 Check out contest rules and details at www.cortezquiltcompany.com. 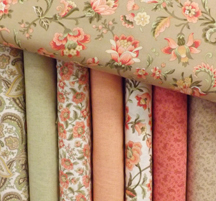 This is one of the softest, most elegant collections we've ever had in the shop. This fabric won't last long. And that's all we have to say about that! And this probably won't be around for very long either. The rich, beautiful colors have a watercolor feel. You can make this quilt top in an afternoon . . . we’re not kidding! Use a jelly roll and in no time you’ll have the top made for a full-sized quilt. These are so much fun to make because they don’t tax your brain. You can sew and talk and have a good time and go home with a beautiful finished product. Cyndi Foote will teach this class. We now host BERNINA Club on the second Tuesday of each month from 1 – 4 p.m. During each club meeting you will complete a small project using a variety of presser feet, accessories, and/or techniques. BERNINA Club is free for one year after the purchase of a machine from Cortez Quilt Company. After one year and for participants who bought machines elsewhere the cost is $12 per meeting. Kit fees or pattern purchase may apply for some classes. You do not need to own a BERNINA to attend club meetings . . . all sewing machines are welcome! Bring a show and tell item and be entered to win a special gift at each BERNINA club meeting. First Club Meeting: Tuesday, June 10, 1 – 4 p.m. This is a cute little zippered bag perfect for cosmetics, sewing accessories, coupons, or your chocolate stash. Techniques you’ll learn include how to put in a zipper and how to sew on buttons using your sewing machine. Feet featured: Patchwork (1/4 inch) foot, walking foot, zipper foot. We will also demo how to use the button sew-on foot (although it’s not needed for this project). Supplies: Pattern (purchase required); 2 fat eights, 1 fat quarter, 1/3 yard fusible fleece, zipper, bring buttons from your stash (or bring your button jar to share and trade). Morning: Introduction to the machine, needles, thread presser feet, various stitches, buttonholes and sewing on buttons, zippers. Afternoon: Stitch Fun. Morning: Introduction to the machine, needles, thread presser feet, various stitches, buttonholes and sewing on buttons, zippers. Afternoon: Stitch Fun and Creative Options. Call 970-565-7541 with questions or to register for one of these classes. Watch the newsletter for future classes!